In 1955, the 5,300-acre Mary Minerva McCroskey State Park was given to the state of Idaho with the stipulation that the ridgeline park be dedicated to pioneer women and the hardships they lived with. 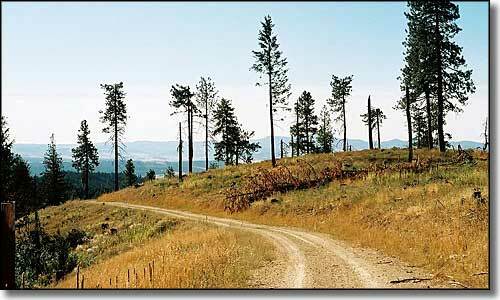 The primary feature of the park is an 18-mile drive along the skyline on unimproved roads that offer spectacular views of the Palouse countryside in the Coeur d'Alene Indian Reservation. The road is recommended for high-clearance vehicles and not for RV's. Facilities available include 4 roadside picnic areas, 3 primitive campsites, a group day-use shelter, 4 developed campsites at Iron Mountain, 5 developed campsites at the fireplace area and 32 miles of multi-purpose trails. Along Skyline Drive is a series of interpretive signs regarding the historical and land-management aspects of the surrounding countryside. This is a "Pack it in, Pack it out" state park with no water or trash facilities available. If your vehicle is longer than 28' or does not have good clearance, avoid this drive! The only fees involved are for reserving the group shelter and for personal use firewood permits. Access is from DeSmet via the DeSmet Road to King Valley Road or from US 95 via Skyline Drive. McCroskey State Park is very unusual in that it was originally put together by Virgil McCroskey in honor of his mother, a pioneer Idaho settler. 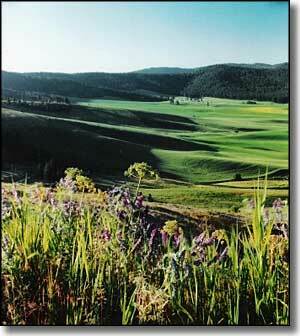 Virgil was a local conservationist who slowly bought up land that was endangered by logging interests. He built the road and the picnic areas. On some slopes he cut out viewpoints through the trees so that visitors could see out over the surrounding area. He gave the property to the state in 1955, but the state wouldn't take the property unless Virgil maintained it at his own expense for the next 15 years (the Idaho Legislature was afraid the loss of property taxes on the land wouldn't be made up for by the revenue generated from the property). Virgil accepted those terms and lived to be 93, dying just a few weeks after the state of Idaho finally took ownership of the property in 1970. Upper photo of McCroskey State Park courtesy of Jgreenbook. Upper left photo of McCroskey State Park courtesy of Dsdugan. Maps courtesy of National Geographic Topo!